Here is the thing: you just got a new iPod and you want to watch some videos on it. You can transfer video podcasts or buy videos from the iTunes store. You can also use a tool like iSquint to convert any video you have to play on your iPod. The small and modest application actually works quite well. You can choose to optimize for TV or iPod and use H. 264 encoding for better quality. One of the most handy features is actually being able to add your converted videos to iTunes, making converting and transferring to your iPod a linear process. Most users will probably use the slider to set image quality, however brasher users will dig in the advanced features, which allow you to crop your video, set framerate, bitrate, width and height. The thing I really hate about iSquint though is the nag screens encouraging you to switch to the developer's other shareware solution VisualHub. You'll be notified every time you launch iSquint and every time you finish a conversion, and naturally there's no way of getting rid of it. The other major drawback is the volatile audio quality when it comes down to conversion. You might need a few tries before you get a video with proper image and audio quality. 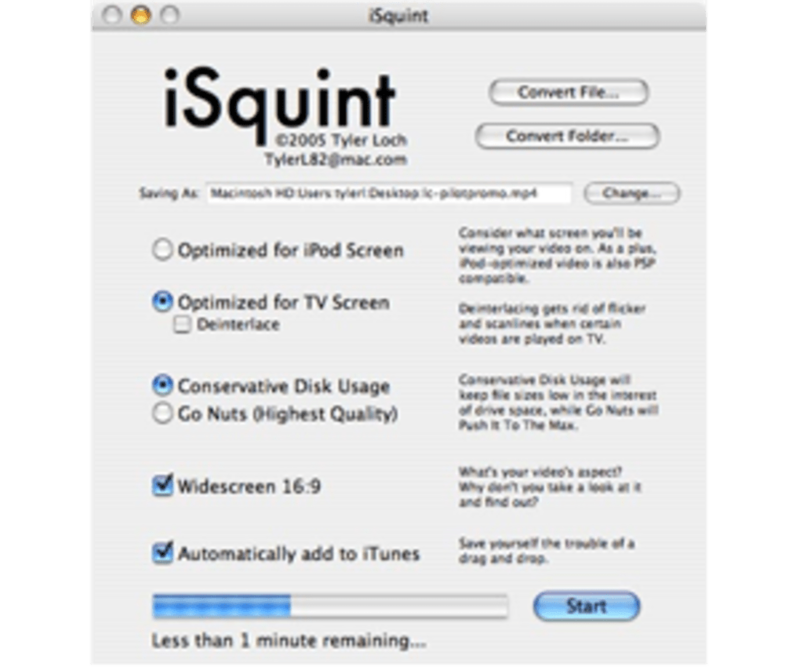 Overall though, iSquint is a good free tool to quickly convert videos to the iPod format and save them in your iTunes library. Certain types of files converted to plain MPEG-4 no longer show up without video in QuickTime Player 7.4 and higher. iSquint now includes a program droplet called "Debreaker" to repair damaged "no video" .mp4 files created by earlier versions of iSquint. Tiny files that finish ridiculously quickly are no longer assumed to be errors. Turkish Localization by Ugur Sofra. iSquint is an iPod video conversion app. It's up to 5 times faster than Apple's method, works well with AVIs and MPEGs, and it's infinitely free-er. It's also rather easy. Give it your file, choose "TV screen" or "iPod screen" size, set your quality, and away you go. On a 1. 5GHz G4, iSquint can convert most video files to iPod-screen-sized videos in realtime. iSquint for MAC - Yeah. Simple to use, works very smoothly - It actually DOES work on a MAC! You can, easily, have more control over quality and other things or do nothing at all and use the, very good, default settings. You can just drag the video to be converted into iSquint. Good program!. I like using it for my iPad it pretty simple to use so far this is the only program that works for me and I think you guys will like! What do you think about iSquint? Do you recommend it? Why?